Omiyage means souvenir, and in Japan it's a must to buy omiyage for family, friends and colleagues. Therefore, after an amazing trip to Kanazawa, make sure to grab some treats before boarding the train. Here are a few good suggestions! 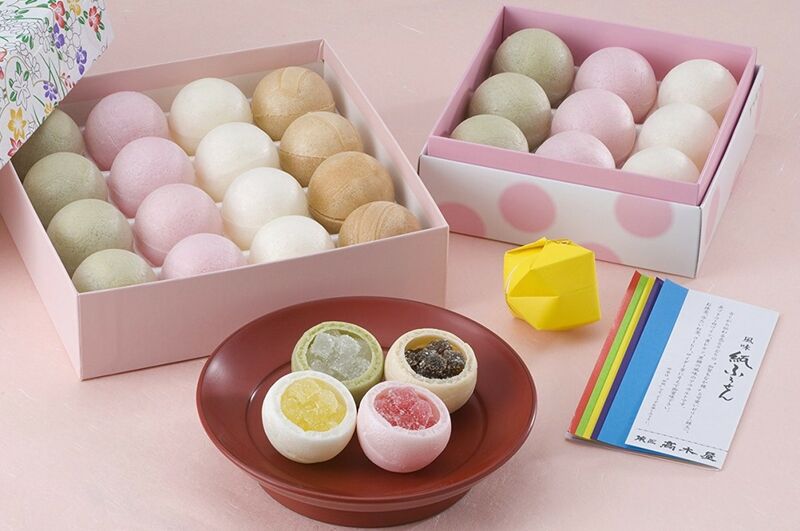 Kamifusen, named after paper balloons, is a special wagashi (tradition Japanese confection) sold in Kanagawa. Made by Takagiya, a well-known confectionery, it's a kind of monaka—a type of wagashi that has a crunchy surface with a soft, sweet filling. Usually monaka contain sweetened bean paste, but Kamifusen have different flavors of jelly stuffed inside! The different colors represent different flavors (lemon, grape, white wine and brown sugar) and packages come with origami paper so you can make your own kamifusen. If you're living in Japan, more than likely you've heard of castella, a cake that was imported from Portugal in the 16th century and spread all across Japan. Though Nagasaki is considered the home of castella (as Portuguese merchants in Japan could only stay in Dejima, an artificial island in the bay of Nagasaki) you might wonder why castella is special in Kanazawa. 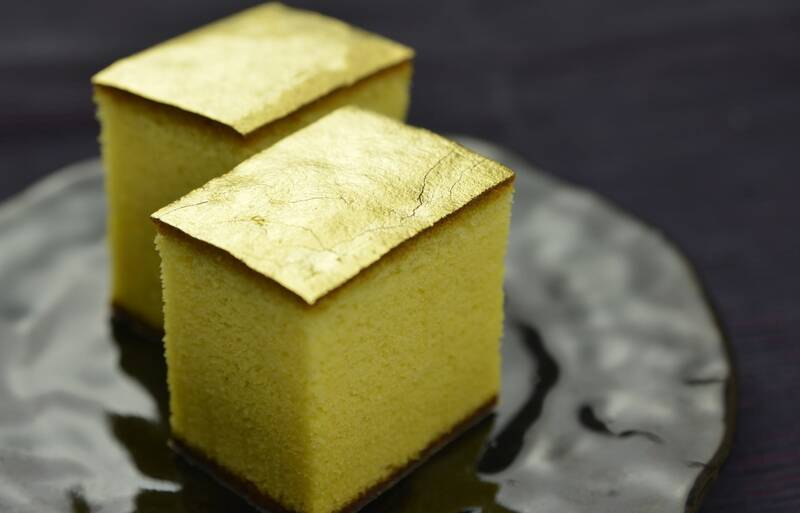 Only in Kanazawa can you find a castella with gold leaf on it. Because Kanazawa (金沢) has the same kanji as gold (金) in its name, Kanazawa boasts omiyage and food with gold leaf as local specialties. It's a great way to share the elegance of castella and gold to your friends! This one from Mameya is the best. Anzu mochi is another famous product from Takagiya. Anzu means apricot and this apricot mochi (glutinous rice cake) tastes very good! The anzu is very fresh and juicy but not too sweet; the mochi is soft and dazzling in a very sharp orange color. You shouldn't miss it! While it's an incredible treat, it's one that can a bit tricky to take home, especially if you live abroad or are traveling without access to a fridge. These sweets have a very short shelf life of four days and it's recommended to serve them cold. If you're only traveling a few hours to your destination, be sure to ask for ice packs to keep it fresh on your way home. Otherwise, refrigerate it before giving it as a gift or eating it yourself. A famous omiyage made by Ishikawaya, Kaichin are candies that are shaped liked flowers or animals in lovely colors. They look simple, but as Japanese people generally love cute things, you'll be very popular if you give your friends such cute omiyage after coming back from Kanazawa!